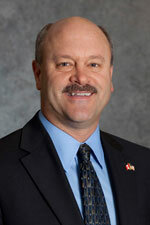 Alan has served on the board of directors since March 2011. He is chair of the Compensation Committee and also serves on the Health, Safety, Environment and Communities Committee. Alan has worked for ALLETE Inc., a Minnesota-based energy company, since 1982. He has held various positions including vice president of generation operations, senior vice president of Minnesota Power operations and COO. He was named president of ALLETE in 2009, became CEO in 2010, and now serves as chairman of the company. Alan served as mayor of Aurora, Minnesota from 1988 to 1998 and is a member of the board of Edison Electric Institute, Essentia Health East Region and of the Area Partnership for Economic Expansion (APEX). He resides in Minnesota.